Friday night, driving home from the theater, I asked Stephen, "What was your favorite part?" "The very end," he said. "Great. I can't talk about that on my blog." Actually, if I knew everyone was familiar with the source material for Mojada, I probably could, but I just can't be sure of that. I'm a stickler for spoilers and generally don't want to read the back of the book or see the trailer of the film. Had I not already known the story of Medea, I probably would have avoided checking it out before seeing this play. In a way, though, I'm glad I knew Medea, because without that in mind, I may have been confused by Mojada's climax. For me, there are a couple elements in the play that make the story wonderfully compelling but that also make it difficult to fully believe what happens in the end. Part of it, too, is simply that I'm viewing this play through the eyes of the modern audience, which tends to be skeptical about classical high tragedy. However, that last moment is pulled off so skillfully, so chillingly, and themes are pulled together so deftly, that you're still left awestruck. 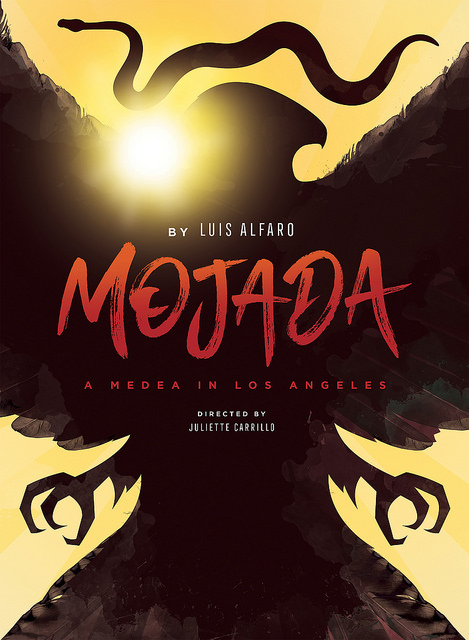 With Mojada, Portland Center Stage continues its tradition of exploring culture through and promoting diversity in theater. Luis Alfaro's play is a modern take on Medea, centered in Los Angeles and following the plight of a family of illegal immigrants from Mexico whose crossing was harrowing and whose past was even more so. For seamstress Medea, her husband Jason, son Acan, and their nurse Tita, one would think finally settling in America would put tragedy and hardship behind them, but one year into their new life, they find that ambition, assimilation, and the elusiveness of the American Dream can hold their own dangers. I loved the set, with its chain-link-fenced yard and looming, crooked shack of a home. The house seemed some strange, magical combination of structure and painting, both three-dimensional and flat, both real and unreal. It seemed to underscore the fact that for so many, that American Dream is an illusion. 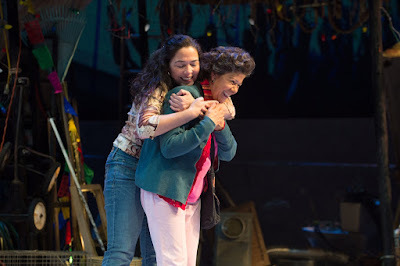 VIVIS (I believe she spells it with all caps) is great as Tita, the nurse who is also a one-woman Greek Chorus, telling the family's story, with plenty of her own commentary, often seeming to voice what the rest of the cast are afraid to say out loud. 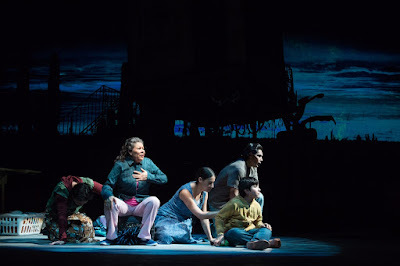 My favorite performance was Nancy Rodriguez' Josefina, a quirky food cart merchant desperate to make good, to have a baby, to be American, even though she acknowledges that it's a country full of pain (she insists on being called by her Anglicized name, Josie). Quirky side characters in theater, film, and TV are often overdone to the point of annoyance, but Rodriguez plays her part with a lovely oddness that never goes too far and never becomes old hat. She's delightful. Rodriguez' performance, together with the writing of her character, also allow you to overlook a truth about Josefina so that you are (at least I was) utterly surprised by where her story arc lands. I couldn't help but view Mojada through the lens of today's politics and today's troubled times. For me, America felt as much a character as all the people in the play - and that character was the bad guy. A bait and switch artist, a fickle lover who only wants you if you're willing to give up who you are. 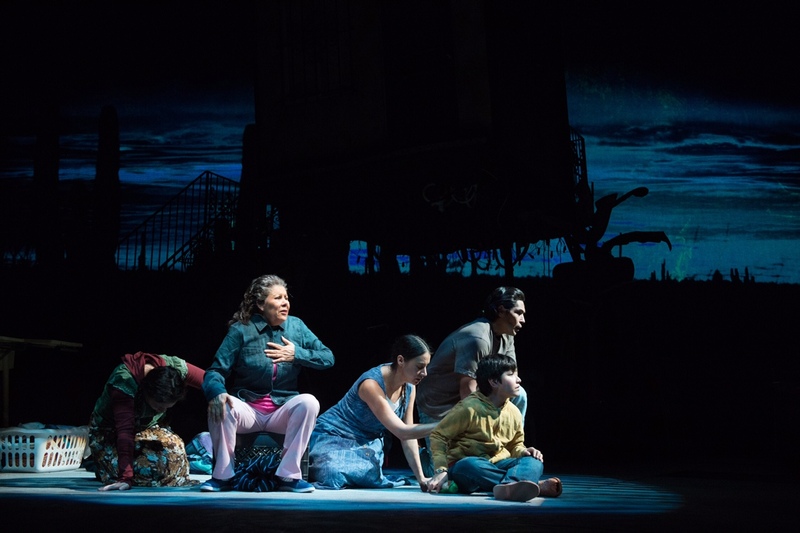 The depiction of the family's trek to America was disturbing and heartbreaking, but the continuation of their story in this country, though more comfortable, seemed to contain an underlying menace that was just as disturbing. That's not to say that Mojada is nothing but tragedy-tragedy-tragedy. Though that's what the source material warrants, much of Mojada is funny and full of moments of joy. There's something about the backdrop of all that hardship that makes those moments of joy particularly sparkle. I can only hope it's that way in the real world. Photos are courtesy of Jenny Graham of the Oregon Shakespeare Festival. More info on the show is here. It runs through November 26th. Recently, I was hired by local author Theresa Griffin Kennedy to design the cover for her short story collection Burnside Field Lizard. (How's that for a title!) Theresa has her fingers in lots of different areas of the arts community - as a writer, a journalist, an activist and more. I first became aware of her when she interviewed Margaret Malone on Oregon Voter's Digest (Margaret has the clip on her website here). When I'm working directly with authors, they often come with ideas or expectations or images they'd like to see incorporated. 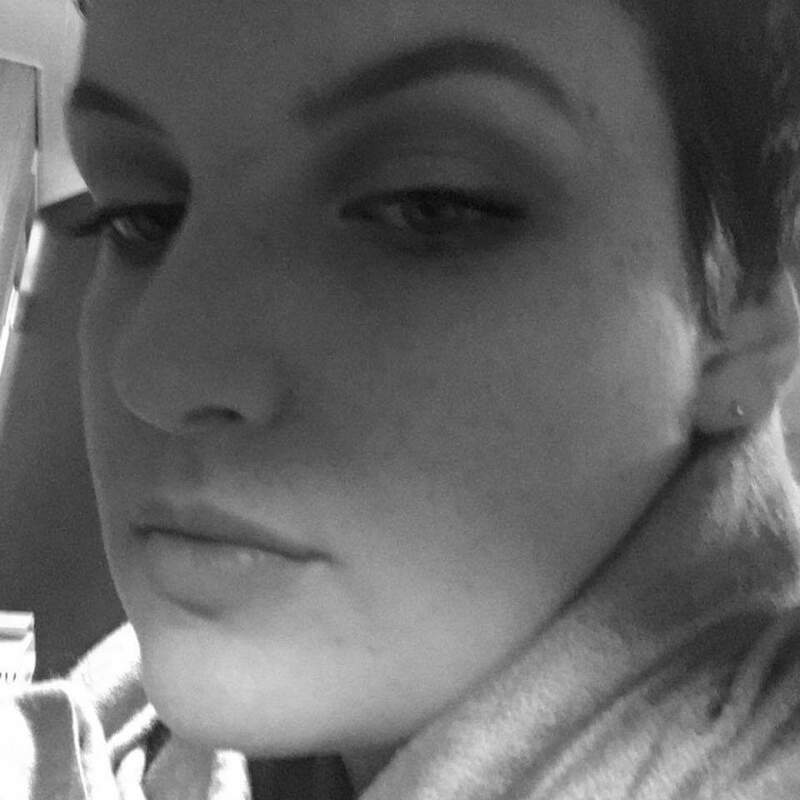 Theresa had a picture she wanted to use because of its randomness and its dynamic look. It was taken by her daughter Amelia Kennedy. 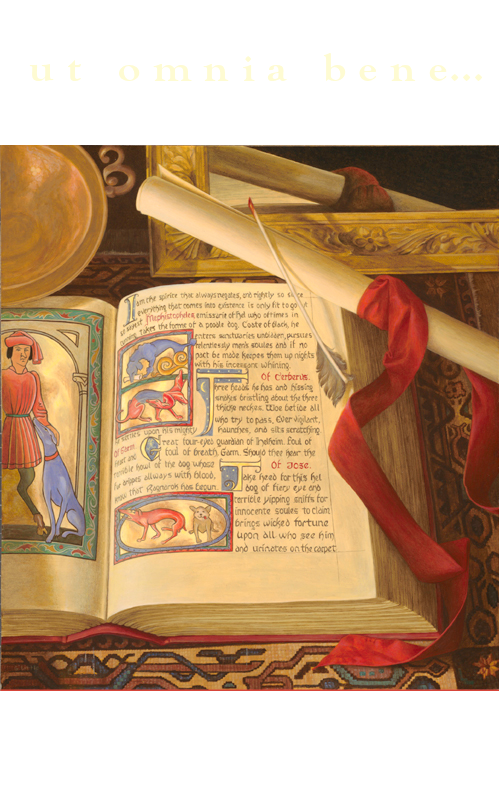 It's a very interesting picture with great lines, but unfortunately it's very small, and I'd need something quite a bit larger for print quality. 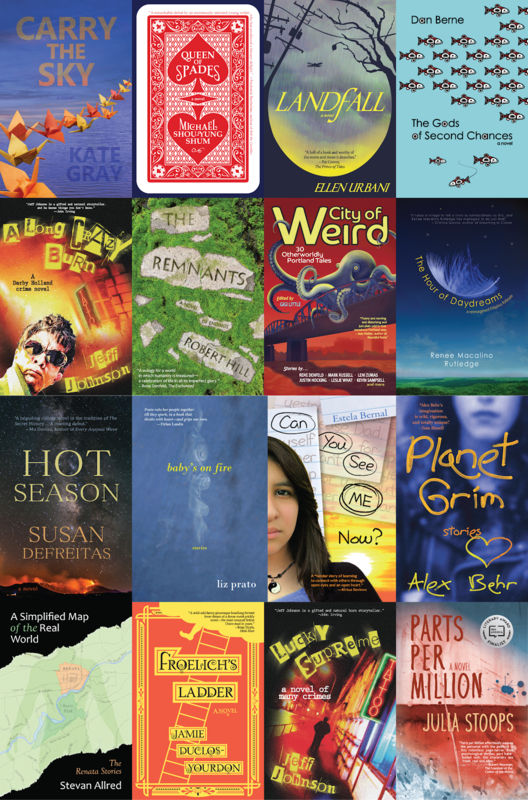 Also, there isn't much space in the picture to add the elements you need for a book cover without blocking too much of the imagery. I needed more space around the central figures. So, I offered to recreate the picture. That was fun. Water and ice in the glass gave me cloudy white rather than orange, so I poured some margarita mix in the water. Then I added some red wine. Then I drank it. Just kidding. In the original photograph, I like the straw a lot for composition, but for my purposes it would have gotten in the way, so I left that element off. I took a bunch of shots, moving the ice around to get different playing fields for my title and blurb. I played with photoshop to get the shade and vibrancy I wanted, and actually, I did a little cut and paste photoshopping on the blue dinosaur because its head was turned too much to one side. 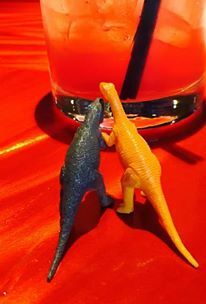 It was fun, too, to figure out where the text would look good within the space of the picture, following the angles of the glass and the tip of the dinosaur tail. Here's the finished product. it yet, but I'll give her a photo credit alongside my design credit on the back of the book. In the meantime, Theresa gave me a picture of Amelia to share with you. And an excerpt from one of her stories. This is from "The Convalescent Home in the Doug Fir Wood." We sat in the living room in the evenings, blankets and quilts covering our legs. The room stone cold, the fireplace empty, with long shadows meandering on the fine Morris wallpaper, but surrounded by all our ancient furniture and other fine objects Mother dusted religiously. The candles that had recently replaced the electric lamps gave faint light and added to the haunted atmosphere of two women alone. Despite our seeming wealth, there was not enough food in the icebox to feed us. We lived on boiled eggs, fried potatoes and English tea cooked upon the wood stove that had sat unused for decades in a corner of the large kitchen but was now our only means of survival. Mother used it to cook our food, heat the kitchen, and boil our bath water. As fuel Mother used some rotten pine and apple wood that had been placed in a woodshed behind the abandoned rose garden years before by the gardener. 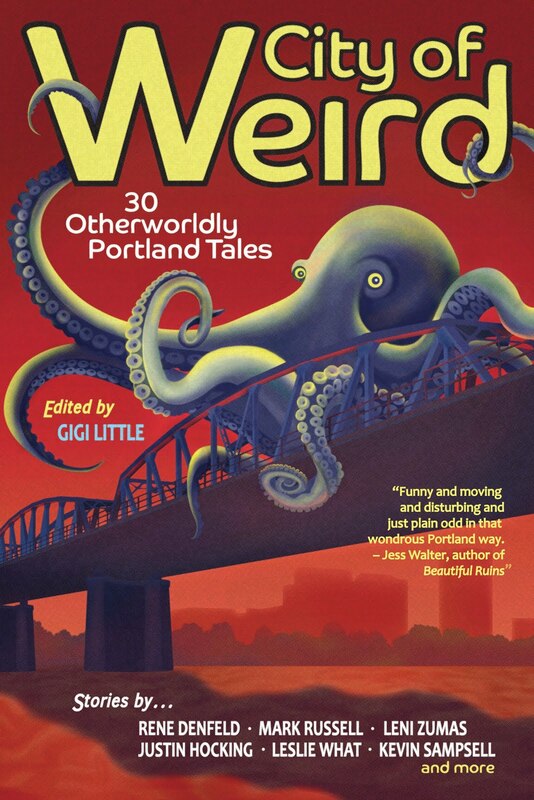 Mother's entire history was dissolving and she was unable to find a solution that could reserve our living room view of the city of Portland and the NW flats so far below our gaze. 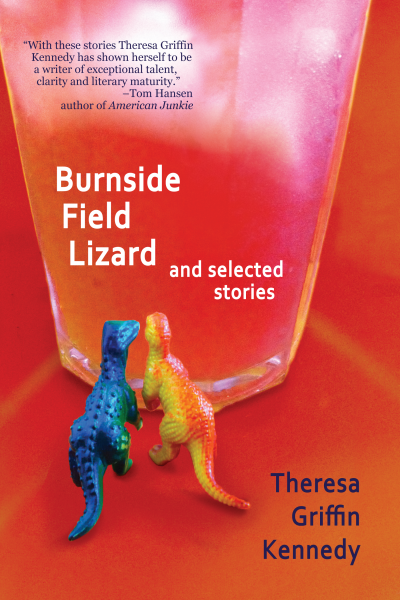 Burnside Field Lizard will be published by Oregon Greystone Press in May of 2018. More info about Theresa Griffin Kennedy is here. The one change I made to the entry is to put the story itself in italics rather than all the quotation marks I have in my diary, because it gets a little confusing. We got 2 Hitchcock magazines in the mail and I turned imediately to the “Mysterious Photograph.” It is a sort-of contest they have every month. They put a picture in the magazine. You take that picture and write a story (250 wds or less) about the picture. The winner gets $25 and the story apears in the next Hitchcock magazine. Well, it was a picture of 4 people on a rocky island. One is fishing. I took the magazine to the computer room, wrote up a story, and set it with the magazine in Mom’s room, where she was napping. “Cast it over there, Starkey." I instructed, pointing to the left of the tip of a rock that jutted out of the water, "It’s in a little box." I sat upon the rocks. The island was in the middle of a large bay, and it consisted soley of rocks and boulders. Starkey stood above me with a fishing poll, carefully casting and recasting the hook into the water; I sat below him, shouting directions; Manfred and Buffalo paced behind us. Starkey lowered the hook, and it sank into the water, once again, with a quiet "ker-plop." He dragged it around for a minute and then brought it out again, bare. Sure, stealing all those jewels was simple, but when Manfred rowed us to the little island in his little rowboat, we lost the box over the side as we docked. Now, I could not leave until we found that box. Our Pal, Nicky, would be here to pick us up and take us down to Mexico tonight; I had to find that box before then. “You have to." I retorted, "We’re not leaving until you do." God knows, I couldn’t leave without my toothbrush. Mom loved it. I was so glad. As soon as I revise it as much as I can, and give it a title, I’m going to send it to the magazine. I like how I was so proud and sure of this story that I printed it out and took it into my mom's room while she was sleeping. I'm sure she proofread it and made me change all the spelling errors before I sent it out. I honestly don't remember what kind of a response, if any, I got from Hitchcock Magazine. 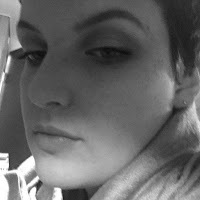 Info on my writing, graphic design and other stuff is at my website here. Info and images pertaining to my graphic design work can be found here. We're Back - A Triumph of the Human Spirit!